Monday June 17 1907 I did a big washing alone. I did house-work most of the afternoon picked straw-berries for supper and folded the clothes. I wanted to go down town after supper but the boys were late home from their work. They have plowed the corn once It was a warm day. Birdie went home. Ott to Dakota for a few days. Tuesday June 18 1907 Will churned for me. I then got the ironing done before noon and things from the garden for dinner. It was very warm. I wrote Lydia in afternoon and did other writing Will came in and we put in the screens before supper. Did evening work. The boys are both plowing corn. 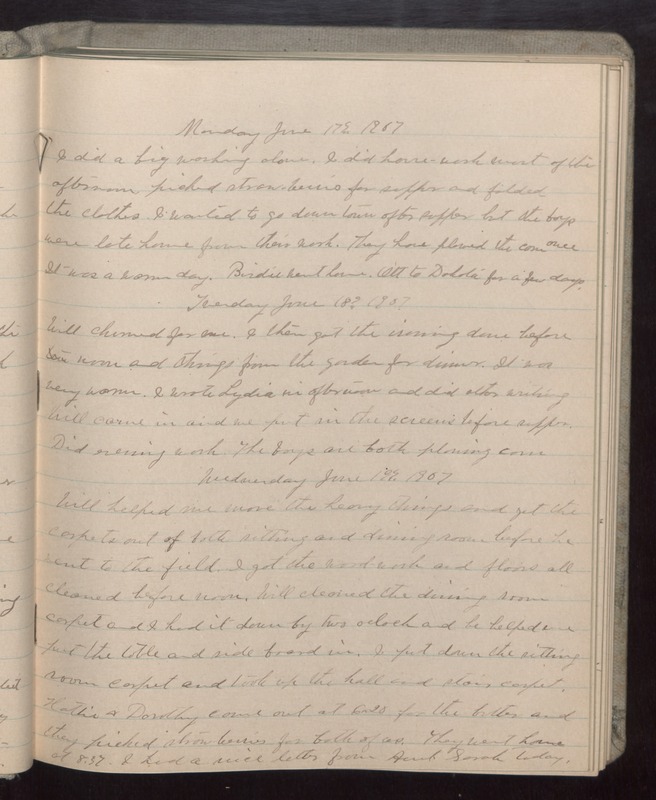 Wednesday June 19 1907 Will helped me move the [illegible] things and get carpets out of both sitting and dining room before he went to the field. I got the wood-work and floors all cleaned before noon. Will cleaned the dining room carpet and I had it down by two oclock and he helped me put the table and side board in. I put down the sitting room carpet and took up the hall and stair carpet. Hattie & Dorothy came out at 620 for the butter and they picked strawberries for both of us. They went home at 8.37. I had a nice letter from Aunt Sarah today.